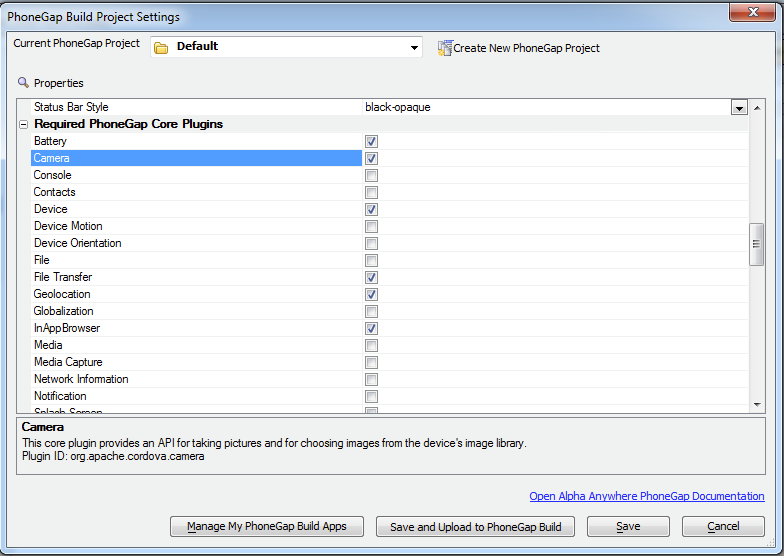 Alpha finds the PhoneGap Plugins you need and automatically includes them with your project. Alpha gives you quick access to the applications you have created with a built-in manager screen. Alpha generates the application icons and splash screens for all of the supported platforms and at all of the required resolutions. Plugins are native code modules that allow your HTML5 applications to interact with device hardware. Some examples include file access and geolocation access. At the time this document was created, Alpha Anywhere had 72 built in plugins and more are on the way. Instead of hunting down and referencing these plugins yourself, you simply check the box next to the plugins you need. From within the IDE, the developer can login to their PhoneGap Build account and create a new business app, update an existing app or choose to delete an app on PhoneGap Build. We’ve also built a PhoneGap App Manager that lists all available PhoneGap Build apps and includes buttons that display the QR codes which allow the business app to be installed on a mobile device for immediate testing. Alpha automatically generates all of the app icons and the splash screens for all of the supported platforms and at all of the required resolutions, handling both retina and non-retina displays. This is typically a day long process in itself, and we’ve boiled it down to picking a few images, taking just minutes. Alpha Anwyhere includes written and tested code to extend the features of the plugins. Here are just a few examples: Working with Pictures – Alpha let you access the “exif “data of the pictures on the device, including the where the photo was taken, it’s date time stamp, the orientation of the camera when the image was captured and other data. Working with The File System – Alpha includes code for working with a large amount of data (in excess of 5MB) when offline - based on a simple or complex nested database query while the device is online. An example use case is a product catalog or a selection of customer accounts for mobile field access when online connectivity may be intermittent or simply not available. Working with Audio – For applications that need to permit voice dictation and audio capture, Alpha includes code that saves data in a common format that works on iOS, Android, and other platforms. It also allows you to control compression to save storage space, and it allows you to pause and resume audio recording. With PhoneGap Build Integration, Alpha Anywhere lets you build true mobile apps and saves you enormous amounts of time during initial setup, during initial development, and during iterative development for bug fixes and feature enhancements. Click here to learn more about how to build hybrid applications with Alpha Anywhere.